Customer self-service portal. Base license supports 10 managed devices (security instances): VDOM/VM/FortiGate. Security instance sending files to a Sandbox counts as two devices. Number of access points allowed is 10X the devices licensed. Requires FortiManager and FortiAnalyzer. FortiPortal is an advanced, feature-rich hosted security analytics and management enabler for FortiGate®, FortiWiFi® and FortiAP® product lines, available for MSPs as a VM software solution/product which can be deployed on a hosted services infrastructure. This allows MSPs to build highly customized private cloud services for their customers. Specifically designed to meet the managed services needs of MSPs, FortiPortal provides a comprehensive set of WiFi and security management features within a multitenant, multi-tier management framework. 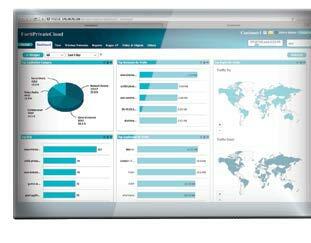 This enables MSPs to view and manage all of their customer networks from one single pane of glass. It also provides turnkey, easy-to-deploy customer portals for self-service without having to worry about complex development or maintenance costs. FortiPortal offers the power, efficiency, and features of a public cloud, with the security, control, and performance of a dedicated environment. Provides MSPs the facility to build privately-hosted cloud services that improve control and enhance profitability. Out-of-the-box integration with Fortinet products - FortiManager, FortiAnalyzer, FortiGate and FortiAP provides turnkey service enablement. 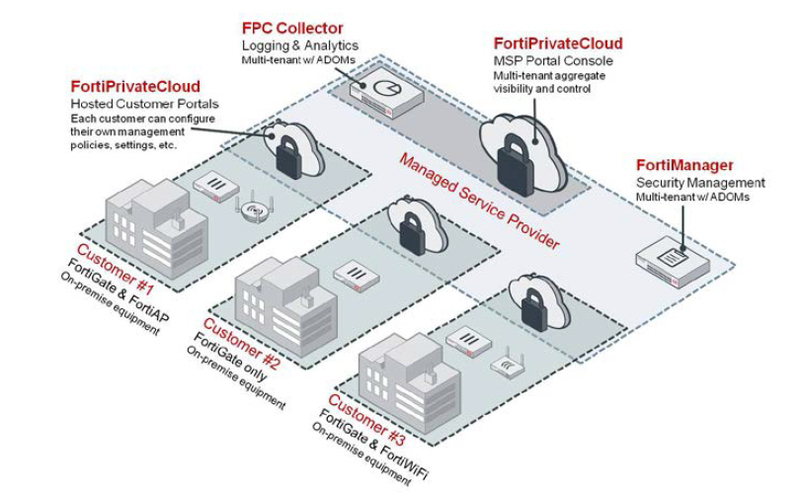 MSPs currently leveraging Fortinet products can utilize their existing equipment and investments to scale out a hosted FortiPortal environment. Virtualized private cloud solution gives MSPs flexibility and full control White label and customize the wireless and security management environment to individual customer needs thereby introducing premium revenue streams. Quick route to market for value-added services Hierarchical add-on to FortiManager and FortiAnalyzer to provide rapid roll-out of customer portal services. Multi-tenant capable MSPs can manage multiple customers, sites, devices and virtual domains all from one dashboard. Cloud elasticity, scaling and ease of deployment Scalable and elastic deployment model, all virtualized, just add additional Collectors and Data Stores to increase capacity. Pay-as-you-grow Scale to hundreds of devices as customer network needs grow. Next Generation Firewall (NGFW) capabilities Ability for MSPs to set up identity-based security policies and application management on Content Filtering, Application Traffic Control, Antivirus and Intrusion Prevention. Role-Based Access Control (RBAC) MSPs can assign administrators to securely manage their assigned tenants. In addition, RBAC provides ability to set customers up with read-only access to reports, troubleshooting and other tools or full access to configuration changes on the network. FortiPortal consists of two major components - a collector engine that processes network events (typically from FortiAnalyzer) for reporting and a portal engine that facilitates customer device configuration (which interacts with FortiManager). The FortiPortal VM acts as a backend interface to both FortiAnalyzer and FortiManager where it maintains aggregated logs and customer configuration information. Customers can manage their own devices through a self-service portal and the service provider can access a multi-tenant interface which shows a variety of administrative functions. FortiPortal gives the service provider multi-site visibility and control, automated alerts and user analytics that make deploying, securing, and centrally managing branch and distributed networks very easy and intuitive. Download the Fortinet FortiPortal Datasheet (PDF). Upgrade license for adding 10 devices to FortiPortal-VM-BASE. Upgrade license for adding 100 devices to FortiPortal-VM-BASE. Upgrade license for adding 1000 devices to FortiPortal-VM-BASE. Upgrade license for adding 5000 devices to FortiPortal-VM-BASE.